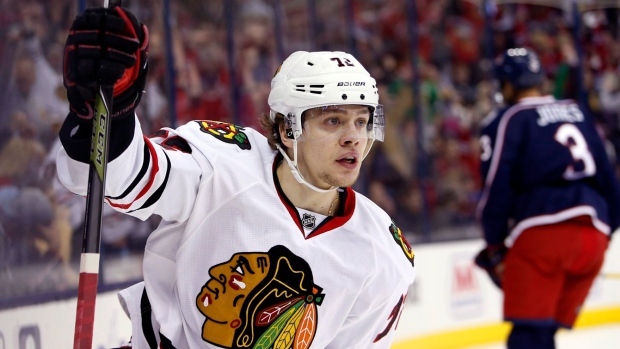 The Chicago Blackhawks have signed Artemi Panarin to a two-year contract extension. TSN Hockey Insider Bob McKenzie reports the extension is worth a total of $12 million - an average annual value of $6 million. Of Panarin's $6M total income next season, $4.2M is is signing bonus. In second year, signing bonus is $2M. An official team announcement is expected on Thursday. The 25-year-old native of Korkino, Russia was a revelation in his rookie season with the 'Hawks, scoring 30 goals and adding 47 assists on the way to claiming the 2016 Calder Trophy. Signed as an undrafted free agent by the Blackhawks in April 2005 to an entry-level deal, Panarin previously played three seasons for SKA Saint Petersburg of the Kontinental Hockey League, winning the Gagarin Cup in 2015. On top of the Calder, Panarin was awarded the 2016 Kharlamov Trophy, given to Russia's top hockey player for the year. Through 37 games this season, Panarin has 15 goals and 22 assists. Panarin will be an unrestricted free agent when the deal expires after the 2018-19 season. Scott Powers of The Athletic Chicago was first with news of the deal.